We visited Isle Royale National Park on the northern shore of Lake Superior in 2014. 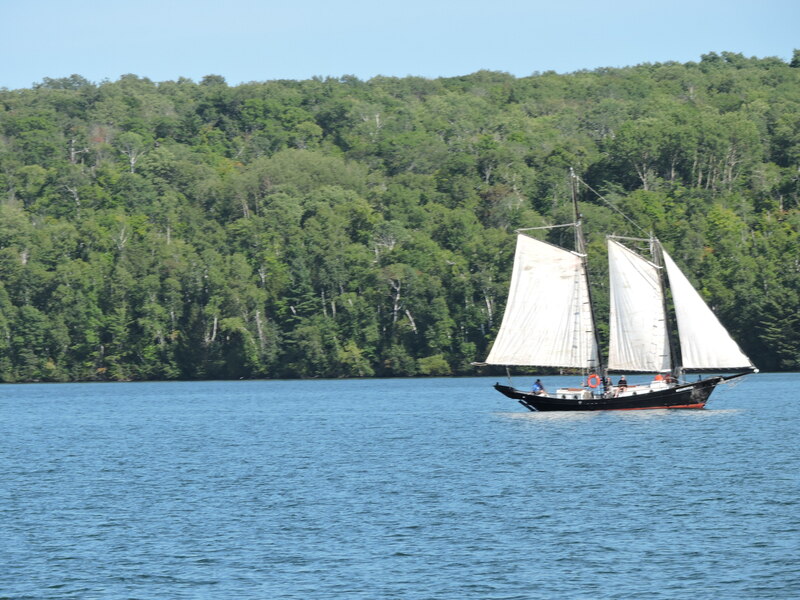 This year, we headed for Apostle Islands National Lakeshore on the southern shore. There are twenty-two islands. The Ojibwe First Americans hunted and fished the area for hundreds of years. They ceded the land to the U.S. in return for annuities, reservations and certain rights of use to the ceded lands which they continue to exercise today. The area became a center of commercial fishing, sandstone quarrying and logging. But today, recreation and tourism are the main activities. 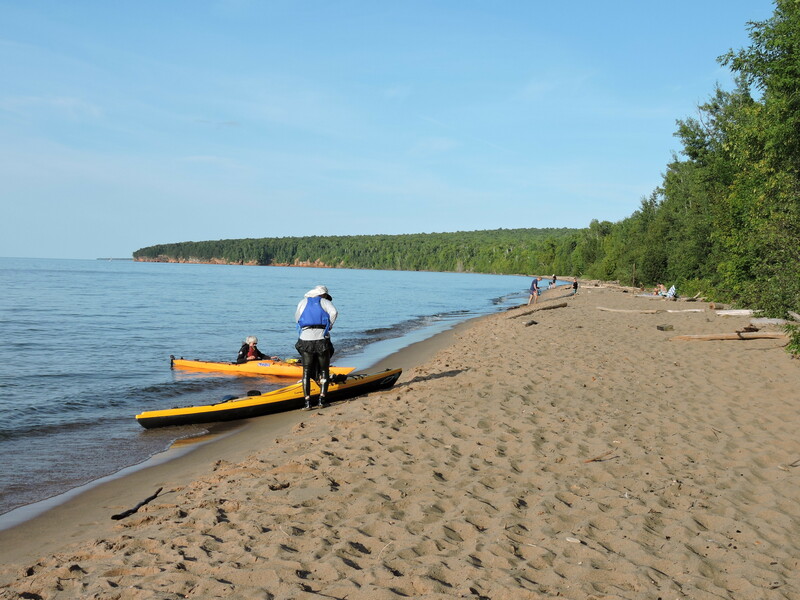 With 80 percent of the National Lakeshore now protected as wilderness, it appeals to younger people looking for an outdoor experience such as camping, hiking, swimming [brrr! ], sailing, fishing, exploring for shipwrecks, and sea kayaking. More “mature” folks such as ourselves can take water taxis to islands or one of the daily excursion boats. Seven light stations were built on the islands between 1857 and 1915 to help guide boats into safe harbor. In 1890 nearby Ashland, serving 400 ships a day, was the second busiest port on the Great Lakes next to Chicago. But as ships grew in size and markets shifted, the lights purpose evolved to now help vessels avoid the islands. The park was not well-known and had between thirty thousand and forty-five thousand visitors per year. Then in the winter of 2014, Lake Superior froze to a sufficient depth that the Superintendent permitted people to hike and ski on the ice to visit sea caves in the park. These sea caves have been carved into the cliffs by centuries of waves, wind, freezing and thawing. These same forces in the winter create marvelous ice stalactites and sculptures in these caves. The caves and their ice were discovered on social media, and park attendance soared to one hundred and forty thousand people in just two months in 2014. The ice was thick enough again in 2015 but the caves were not accessible in the winter of 2016-2017 or this last year. It is not an easily undertaken adventure. Walking to the caves involves a two mile hike over treacherous ice in Lake Superior’s unpredictable weather. We were there for a summer boat excursion and enjoyed watching the kayaks and small boats make their way in and out of the caves. This entry was posted in Travel Logs and tagged Apostle Islands National Seashore, Ice caves, Travel, Wisconsin. Bookmark the permalink. The scenery is beautiful and I’m very partial to lighthouses. I have two here in the house that belonged to Bill’s aunt and one of them my mother had from San Francisco. My memory is slipping I think because I can’t remember what the material is they were made from. Just love lighthouses. It’s a beautiful place. Good to know it’s a protected area now!